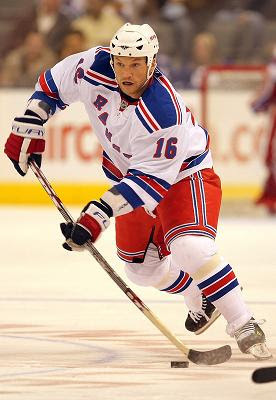 In the Dirt: Avery: Stick a Fork In Me "I'm Done"
Avery: Stick a Fork In Me "I'm Done"
Ranger winger Sean Avery's season might be at an end after being placed on the injured reserve for the third time this season according to the NY Post. Avery missed nearly all of December after getting surgery on the left hand and now the Rangers want to keep him from missing more time with an additional surgery on his right hand. “I'm hoping it will heal on its own by resting it, but if not, I don't know, I guess then I'd have to consider surgery,” said Avery. “It's the same bone that was broken in the left hand." Having the surgery may be Avery's preference, but the Rangers season might lie in his hands. It is their preference for him to avoid surgery and opt to rest the hand instead. “It's at a point now where it needs rest; it needs to settle down," head coach Tom Renney told the Post. When asked about surgery he added, “it's a possibility he more than we are contemplating." Avery has missed 23 out of 44 games this season due to a shoulder separation in October and surgery on his left hand in December. If his season is over it is a real threat that the Ranger's season could be over as well. The Rangers play noticeably better with him in the lineup. Overall they are 20-19-5, but are 12-7-2 when he plays and 8-12-3 when Avery is out. Last season Avery was credited with turning their season around as the team went 17-6-5 after acquiring him on February 5 from the Los Angeles Kings.